Currently available on the DL Deals Store, you can pick up a colossal 10,000mAh battery pack to help get you through those long days. 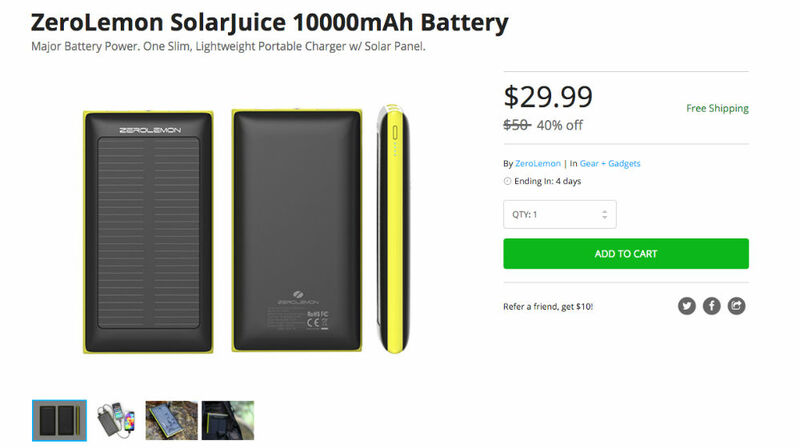 Regularly priced at $50, this battery pack is listed at just $29.99, featuring a small built-in solar panel (yup) for charging, and water resistant design. Interestingly enough, the SolarJuice battery pack also features “anti-explosion” technology, which I must say, is good to have. In addition, the pack features two total outputs – 2A fast-charging for mobile phones and 1A charging for other devices. If this massive battery pack interests you, follow that link below.